Watch this exclusive Mr. Media interview with Stephen Rosenfeld by clicking on the video player above! 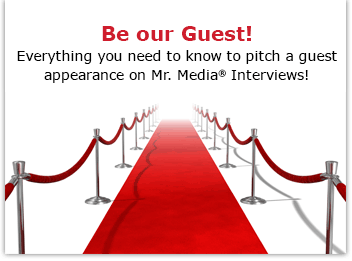 Mr. Media is recorded live before a studio audience full of people who are convinced they are a whole lot funnier than you and you and especially you… in the NEW new media capital of the world… St. Petersburg, Florida!! Mastering Stand-up” by Stephen Rosenfield. Order your copy today by clicking on the book cover above! If you’re not funny, if you’ve never been funny, if friends don’t flock to hear you tell stories about your crazy life, I’m afraid today’s guest, Stephen Rosenfield, can’t help you. On the other hand, if you’re one of the rare men and women with natural gifts for hitting a punch line just right, for reading a crowd, large or small, or who can convert a life of small, precious moments into big laughs, the author of Mastering Stand-Up: The Complete Guide to Becoming a Successful Comedian might know a valuable thing or two that you will find useful. Rosenfield is the founding director of the American Comedy Institute and his alumni are as diverse as Jim Gaffigan and Lena Dunham – talk about opposite ends of the spectrum! In his book, he writes about the different types of comedy and comedians, and breaks down the techniques and behind-the-scenes details that can make or break a modern comedian. I’m not interested in jumping onstage, but I’m fascinated by stand-ups and their careers. In that regard, I found Mastering Stand-Up to be compelling and rich in detail.